Celebrating its 40th year, the First Friday ArtWalk (presented by the Lane Arts Council) is a guided tour offered year-round in downtown Eugene. 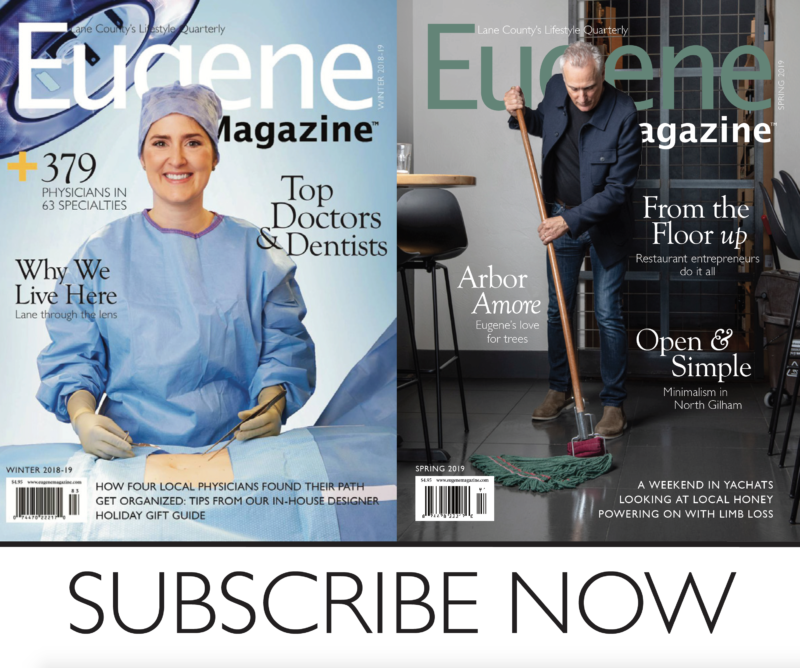 It doesn’t matter if it’s pouring rain or beaming sunshine, every first Friday Eugeneans are encouraged to hit the streets of downtown Eugene to view artwork from a selection of galleries, artists, and venues. Working in a variety of media—everything from upcycled art to oil landscapes—this year’s summer lineup is sure to excite all appreciators of art. The first Friday in June kicks off the summer season with pieces by featured artists from the nonprofit St. Vincent de Paul. Artist Mitra Chester, for example, will showcase her selection of designer clothes created by using recycled materials. Chester’s designs (ENVIA, UpSmart, and Re-Play) can be found at any local St. Vincent de Paul store. Her ultimate goal is to produce products that are sustainably made and affordable for customers. “When wearing ENVIA, you’re expressing yourself with inventive style that makes a difference,” says Chester. Chris Jenkins, featured artist from the St. Vincent de Paul recycled glass foundry Aurora Glass, will display his glass artwork. With a degree in ceramics and a background in teaching, Jenkins brings his artistic talent to Aurora Glass, which opened in 1998. From the beginning, Jenkins has been responsible for numerous Aurora glass molds. Bob Keefer, landscape photographer and former arts writer for The Register-Guard, will show his innovative hand-colored black and white photographs of trees in the “Among Trees” exhibit held at InEugene Real Estate. These photographs will feature trees across Oregon, along with a special selection of photographs from the Malheur National Wildlife Refuge. The June ArtWalk will also feature work from Oregon Art Supply and New Zone Gallery. For added entertainment, ArtWalk participants can attend a fashion show held at Shadowfox. The event will feature headdresses made by Rooster Shannon of Rooster Baby, along with wooden art sculptures by Jason Pancoast of Shadowfox Design and sacred art by Hosanna Joy and Hawley Ward of Royal Macabre. The summer ArtWalk fun continues in July with pieces from Out on a Limb Gallery, Vistra Framing & Gallery, and Pacific Rim Art Guild. Heidi Good of Out on a Limb will show her pyrography pieces, in which she adds color to burning wood and paper artwork. Artist Jaqueline Lukowski will showcase the vibrant colors and beauty of the Northwest at Vistra Framing & Gallery. Lukowski enjoys capturing numerous landscapes in pigment, including the wetlands and farmlands of the Northwest. “I hope when someone sees one of my paintings, maybe they will stop and realize how important it is to preserve what is left of our natural and wild lands,” says Lukowski. First Friday July will also include entertainment from the Eugene Ballet Company. In #instaballet at Oregon Contemporary Theatre, ArtWalk attendees will be able to watch Eugene Ballet dancers craft a ballet in real-time. Audience step suggestions are welcomed and encouraged in this all-ages event. Dance photography by local dancer Antonio Anacan will be displayed, and Claim 52 Brewing will provide refreshments. For the summer months, First Friday ArtWalk is from 5 to 8 pm, every first Friday of the month. .